8.5 – 10 : Loved it. 6.5 – 8 : Liked it. 4.5 – 6 : Worth a watch. 2.5 – 4 : Didn’t like it. 0.5 – 2 : Hated it. 0 : Watching paint dry. Warning: this review has spoilers for Jumanji: Welcome to the Jungle. Read part I for a spoiler-free preview! 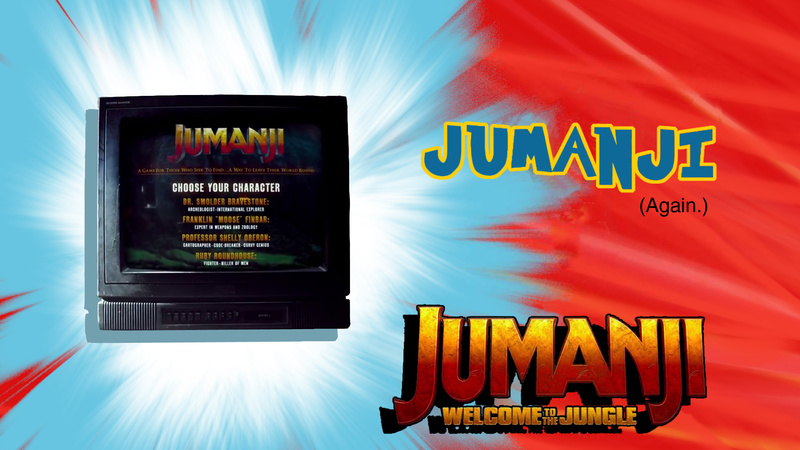 Although most of Jumanji: Welcome to the Jungle takes place 21 years after the original, which was set in 1995, the film opens in the past (1996), when the Jumanji board game is found buried at a beach. The board game is given to a teenage Alex Vreek (Mason Guccione as a teenager, Colin Hanks as an adult), who promptly puts it aside, claiming that board games are boring. Later that night, in a flash of green, Jumanji undergoes a metamorphosis. Alex wakes up to find a video game cartridge in its place. He decides to play it and disappears. 20 years later, Vreek is still missing. His home is now known as the "Freak house", and his father a wreck. We are quickly introduced to the film's main characters: Spencer Gilpin (Alex Wolff), an awkward nerd and gamer; Fridge Johnson (Ser'Darius Blain), an American football player who needs to pass a class to stay on the team; Bethany Walker (Madison Iseman), a popular but extremely vain teenager attached to her phone; and Martha Kaply (Morgan Turner), a studious rebel type. All four soon find themselves in detention; Spencer and Fridge for plagiarism, Bethany for refusing to end a face time call during class, and Martha for refusing to participate in PE (physical education) and insulting the teacher. Their punishment is to spend the rest of the day - and weekend if they have to - cleaning the school basement and removing staples from a pile of magazines. In the basement, they find an old video game console marked for donation. They decide to play and, like Alex before them, are sucked into the game as well. In the game, they are represented by their chosen avatars. Spencer is now Dr. Smolder Bravestone (Dwayne Johnson); Fridge, Mouse Finbar (Kevin Hart); Bethany, Dr. Shelly Oberon (Jack Black); and Martha, Ruby Roundhouse (Karen Gillan). After some initial confusion - and the loss of Bethany's first life - the group eventually figures it out. Each avatar has specific strengths and weaknesses, except for Bravestone, who only has the former. Exposition comes in the form of an NPC (non-player character) guide (Rhy Darby), who informs them that they must save Jumanji by returning a gem back to a Jaguar statue, thereby defeating the corrupted explorer Russel Van Pelt (Bobby Cannavale). Later on, they meet Seaplane McDonough (Nick Jonas), the avatar representing Alex. The absolute worst thing that you could say about Jumanji: Welcome to the Jungle, I think, is that it was very predictable, but even then, it was also very funny and the characters were very likeable. I had a rather enjoyable time watching it. Thinking about the film now, the most impressive thing about it was probably the fact that there was never a time in the movie where I even thought about questioning if the avatars were their "real life" counterparts. It wasn't Dwayne Johnson/Bravestone, Kevin Hart/Finbar, Jack Black/Oberon, and Karen Gillan/Roundhouse in a jungle; it was Spencer, Fridge, Bethany, and Martha. And maybe some of the immersion comes from the stereotypical archetypes used for each character, but the film actually manages to avoid feeling cliche just by the premise and performances. Instead of seeing the millionth Breakfast Club rehash (check out the preview to read a quote from Dwayne Johnson drawing a parallel between the two films), we literally see something different, as each character is removed from their physical appearance. It forces you and the characters themselves to see them for who they are, rather than what they look like. As a result, the movie was more character focused, and the bonding felt real. On the whole, it was really funny as well. All the characters were hilarious, but I thought Dwayne Johnson and Jack Black were particular standouts, the latter especially so. I'd go as far as to say that it was an inspired decision to cast Black as Bethany. Bravestone's smolder skill is also great, especially when paired with the music that came along with it. However, there are some small issues here and there - like when Bethany and Martha exchange forced analysis on each other's personalities early on in the movie - and then there's Fridge's entire character. There isn't a lot of depth to him at all and his arc isn't as satisfying as the rest of the gang. At the beginning of the film, he is sent to detention for having Spencer write an essay for him. While we understand why Spencer does it (to restore his friendship with Fridge), the film does not go into Fridge's motivations. Over the course of the game, his character isn't challenged in a meaningful way either, and most of his moments have a comedic undertone, having to do with reconciling with his avatar's (lack of) size and skills. As a result, he is basically the same character at the end of the film, while everybody else feels more mature. Spencer is more confident and has made the decision to be brave, Bethany no longer lives in her own bubble, and Martha is not afraid to open up to people anymore. In contrast, Fridge is still off the football team and we're not sure how he'll pass the class. The film is also quite predictable and lacks real urgency most of the time; a lot of these problems seem to stem from the video game aspect of the plot. For instance, each player starts off with three lives. Theoretically, the tension should build as they slowly lose them, but that wasn't really the case. The film decided to balance their lives throughout the film, such that when one character lost one, the others would catch up shortly. The worst part about this came at the end, when all the characters were on their last life, except for Martha, who was on two. I didn't feel at all worried, as I knew Martha would have to lose hers before the others - especially after they transferred one of Bethany's lives to Alex. Unfortunately the loss of Martha's second life coincided directly with the end of the game, meaning no one was ever close to losing all three, though the way she lost it was unexpected and pretty cool (especially as reincarnation with the gem was established only a few scenes prior). I will say, however, that I did feel a twinge of fear when Bethany was tackled by a jaguar, but that was the exception rather than the norm. The level objectives were also a bit confusing, and it felt like they all boiled down to "run away from the generic, one-dimensional bad guys." The film ends in real life, where the gang are now friends. They meet Alex, who returned to 1996 after the game ends, and is now an adult with two kids. While it was a bit weird between Bethany and Alex (whose relationship was up-played during the game), it was decently satisfying. We’ll be showing Pitch Perfect 3 and The Greatest Showman in a double bill next week! Come see Pitch Perfect 3 at 18:30 on the 13th of February and 20:35 on the 15th of February and The Greatest Showman at 20:25 on the 13th of February and 18:30 on the 15th of February; you can get tickets at the door from 18:00. Oh, and if you haven’t already, read part I soon for a spoiler-free preview.